Weebly is a drag-and-drop website builder, which is user-friendly and ensures intuitive web building process without the necessity to master the basics of programming. The platform uses a “box” model that lets you change website design and structure based on your needs. Weebly is initially known for its powerful eCommerce engine. Running online stores is simple and convenient here, while the range of features and tools the system offers contribute to the achievement of decent result. Whether you plan to create a small online store with a dozen of products or an impressive supermarket with hundreds of items offered for sale, Weebly is a good tool to start with. The eCommerce feature set of the system is above the average, which allows experimenting with the styles and designs of your online store. Today we will showcase the most remarkable Weebly web store examples that we managed to find on the web. Some of these could pass as professionally designed projects, others have lots of areas to improve. Have fun and be creative! Natureskindle.com is a decent example of a Weebly web store built with customer convenience in mind. The founder and owner of the website is Diosdado Velasquez, who decided to blend his love for nature with his passion for healthy lifestyle, camping and adventures. This is how Nature’s Kindle was born, offering plenty of eco-friendly accessories, gift sets, fragrances and home goods. The web store navigation is simple and intuitive – you won’t face problems looking for the required items here. The website consists of several categories, each offering a certain type of products. All the items are unique and extraordinary – there no many shops offering them right now. However, the list of products available for sale is currently not quite extensive, but the assortment is regularly updated. To find out the characteristics and implications of this or that product, take your time to browse the catalogue – all the items are described in details there. You can choose the type, specifications and quantity of products, when placing the order. If there is something you cannot find in the catalogue for some reason – make use of the search filter option to simplify the choice and save your time! Blairlaurenbrown.com is a web store of handcrafted jewelry, which is carefully designed in adherence with talismanic American traditions. The first thing that catches the attention when you get to the website is the full-size image gallery of featured jewelry items that are presented to the advantage here and urge the desire to keep browsing the web store right from the start. There is also a video on the home page, which is short yet informative, telling the story of Blair Lauren Brown – the jewelry maker and the web store owner. The website itself is convenient and easy-to-browse. The featured items are displayed directly on the home page to grant quick access to them. The rest of the products are available in the web store section of the menu found on the left website panel. The drop down menu does not look imposing yet it offers access to the main web store sections like Best Sellers, Rings, Earrings, Necklaces, Bracelets, Devoted Collection and other categories. Each product is available in several variations based on the specifications of your choice. This includes the material, size of the items and affects their final cost. You can also view the photos of the item you are interested in and read its overview to find out the details. This Weebly-based online store creates light and pleasant impression, coming up to a variety of customer preferences. Gaucho-sur.com is a modern women’s lifestyle clothing brand, which is inspired by “The Gaucho” – the South American cowboy style. This gives all the items and accessories elegant and one-of-a-kind look, attracting the attention of fashion fans from across the globe. All the clothes presented in the shop are designed with a special approach in mind, featuring the combination of trendy fashion styles, quality materials and unique art ideas. Just have a look at the clothes presented in the catalogue to feel the special master’s approach. The catalogue encopasses several popular categories of clothes, including Dresses, Ponchos and Ruanas, Gaucho Pants and Bottoms, Tops. The featured products are displayed here as well, ensuring quick and easy access to any of them. The web store offers free shipping on all the orders, which is an additional urge for customers to buy them. Each item of clothing comes with several photos, short descriptions and order buttons. All in all, the web store looks elegant, stylish and it absolutely comes up to the “Gaucho” style ideas the designers follow, when creating their clothing collections. Looking for a unique gift for your special someone or wish to celebrate a party using original souvenirs and decor accessories? Then get inspired by the ideas offered by Glowgift.com! This is the top notch destination for people, who value creativity and unique gift ideas above all. The Portland-based web store presents modern gift baskets that are custom made to come up to various occasions. They offer personalized handmade gift solutions, which are a real surprise for any event! Just access the web store options to see what they have in stock! Each gift set is comprised of several items and you can select those you wish, which affects the final cost of the order. There is a full description of the gift and an online form, where you should fill out the recipients’ contact data for quick and effective delivery. 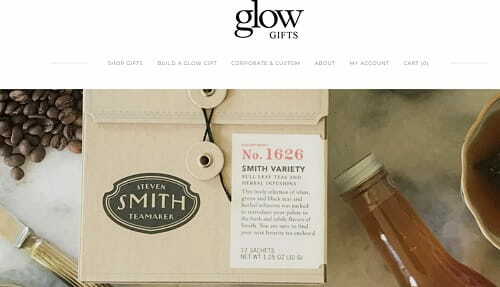 One of the highlights of the shop is an opportunity for each client to create his/her own glow gift basket by choosing and arranging the items that are available in stock. The options are numerous, so, you will surely be able to create a unique and personalized gift for your loved ones! The availability of customer reviews, convenient web store navigation, rich product assortment and variety of shopping options makes it possible to get the best gift-giving experience and lots of positive emotions! This is one of the best examples of a full-featured Weebly store! Beautysandgents.com is a place, where you can shop for high quality moccasins “for all walks of life”. This is how the web store positions itself, highlighting their major specification. They offer a variety of moccasins for men, women and kids. All the shoes feature individual designs and are manufactured of high quality materials. They are presented as individual models and they are also grouped into categories based on the occasions you may wear them for. This ensures simple and effective shopping process, providing an abundance of product choice. 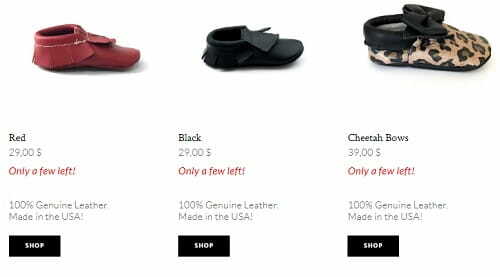 You can view the characteristics and details of each pair of moccasins, customer reviews and ratings, price chart and sizes available in stock. The web store offers free shipping around US for all the orders above $50. If there is something you are not sure about, the live chat feature will help clear up the details to be sure about your choice. This is an appealing Weebly web store created with customer convenience in mind. 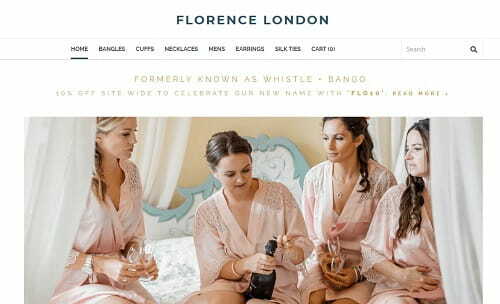 Florence-london.com is the new rebranded name of Whistle and Bango – the web store selling original jewelry items. The author of the website and the master, who creates jewelry, is Rosie Florence, who has a passion for this occupation and considers family bonds the most valuable thing in the world. Each jewelry piece she designs has a personal story behind a person it belongs to. This is what makes the web store stand out from the crowd. The website navigation is not complicated as all the items are on their places here. The menu encompasses several sections presenting different jewelry items, including Bracelets, Necklaces, Silk Ties, Cuffs, Mens, Earrings and more. Each section has a drop-down menu with further product subdivision. The search filter tool helps find the required items with minimum time and effort investment. Customers may not only select jewelry for their special ones, but also give them a touch of individuality by choosing personalization and gift wrapping. 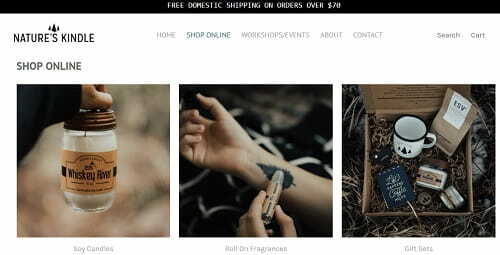 This Weebly web store is stylish, easy to browse and functional – right what most customers need! 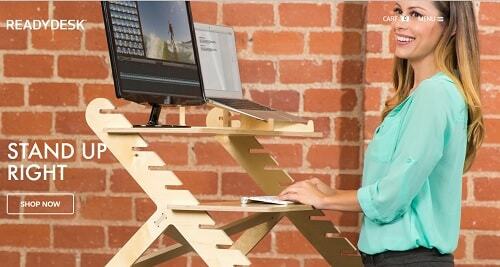 Thereadydesk.com chose Weebly to sell adaptable standing desks which help people avoid the health risks of spending all day sitting in front of their computers. The guys behind The Ready Desk are doing a great job of showing how their products will benefit their users: the long-scrolling homepage gives you an easy and pleasant navigation experience with its hero header, card design style, image slider and anchor buttons, which is one of the hottest web design trends. The well thought-out structure of the website makes it easy to find useful information quickly – there are only 6 tabs in the menu, and all have the standard names – Home, About, Gallery, Store, Contact, Cart. I emphasize this because sometimes site owners go overboard experimenting with the menu. It goes without saying that you must have a fresh, creative approach if you want to stand out. However, you should never overcomplicate things. Keep your navigation solid and simple. Now let’s talk shop. The Store section is clean and informative. Each product has multiple photos, including in-context photos which means the customer’s expectations of the product are more likely to meet reality. Each product has a unique description, product options and also a set of social media icons. The Ready Desk makes their products easy to share, and that certainly helps spread the word about the company. 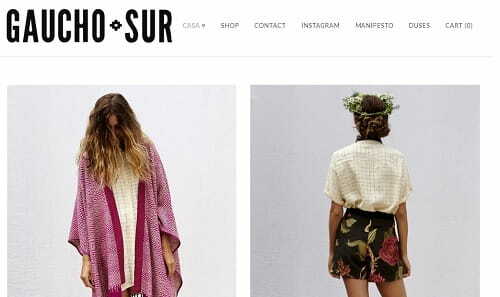 Our congratulations on a beautiful webstore! 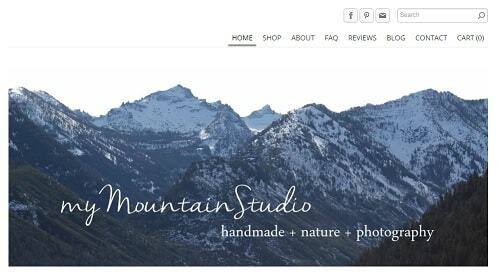 Mymountainstudio.com is a website owned by Nikki Weiss who creates handmade goods and writes insightful lifestyle articles. As described on her homepage, Nikki shares how she is ‘finding little ways to enjoy life more and share inspiration for you to enjoy life more, too’. The Weebly-based website is one of the best examples of Internet-shops, which comes with a unique highlight. This special feature is the harmonious combination of nature-inspired photos and beautiful handmade accessories that can come up to any taste and preferences. Personally, I have never seen such a tremendous online shop before. A single look at it urges the desire to keep browsing through other sections provided at the top of the home page and buy one of the fantastic products created by the owner of the site. Interesting, user-friendly, informative and attention grabbing – the site surely stands out in the crowd! Michileung.com is a brand established by illustrator Michi Leung. 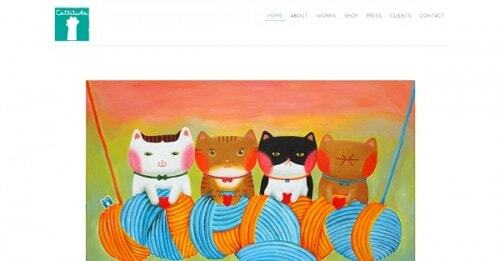 Her illustration features her cats Mea Strong and Faroll as main characters, and reinterprets the stories of them in the products. Michi Leung is no stranger to the fashion and design world, having started to work as an illustrator through an illustration column in Milk and Cosmopolitan Magazine in 2007. Since then, she has collaborated with the Hong Kong environmental Department, Hopewell Holdings Ltd., TaoTi, Nestle (HK) etc. and then started her own business venture. With her Weebly-powered webstire, the designer showcases her works with strong images and product descriptions, and the clean design with lots of space between elements winningly highlights each item. Note how cool and simple her logo is! Great job! 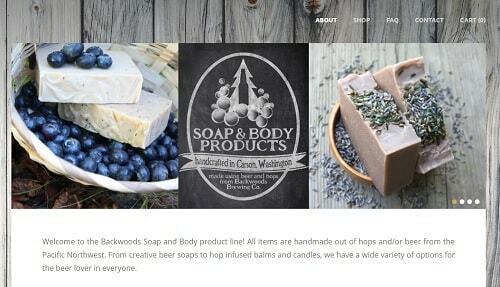 BackWoodsBeerSoap.com – this company chose Weebly website builder to create an outstanding design of their site for them. The Internet-shop focuses on the production and selling unique soap, hop infused balms and candles made out of beer and/or hops from the Pacific Northwest. The unique and unusual specialization of the site is manifested in its design, which combines the most important elements and information the prospective clients are interested in. The highlight of the website is the slider found at the top of the home page, which reveals the photos of products and the ingredients they involve. This catches the attention of the target audience and helps promote different types of soap. The major information about the company is provided on the white background, which does not distract the attention of the customers, but helps focus on the basic moments. For those clients, who wish to find out more about the company and the assortment of products it offers, there is a chance to browse through the points of the main menu, namely “About”, “Shop”, “FAQ”, “Contact” and “Cart”. The only disadvantage that can affect the shopping experience is lack of contact information, which is limited to the e-mail address and online contact form only. This is a bit puzzling and inconvenient. The rest of the design elements are quite okay, which makes the resource user-friendly and exciting to browse! 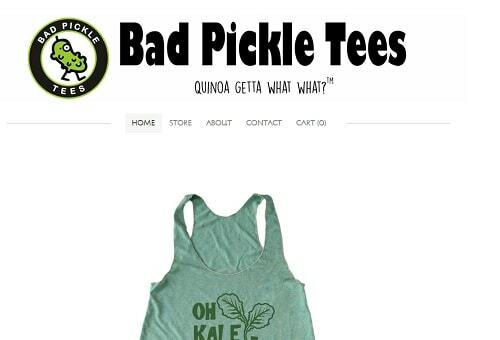 BadPickleTees.com is an interesting example of the e-shop created on the basis of the Weebly platform. The website is devoted to the manufacture and selling fashion accessories and clothes for foodies. The assortment of products they offer is represented by the rich choice of totes and T-shirts for men, women, babies and elder kids. The design of the site seems quite plain at the first sight, but this simplicity is exactly what drives the attention of the customers. The white background of the site helps attract the attention of the potential clients and focus it on the products the company offers. A large slider that reveals the products for sale is that special catchy element that cannot be left unnoticed. The main menu of the resource involves 5 tabs that have recognizable and easy-to-understand names, including “About”, “Home”, “Store”, “Cart” and “Contact”. These categories are more than enough for an online-shop that aims at growing its customer base. The catalogue of products is easy to browse and involves the major categories of clothes and accessories with detailed characteristics and price information. Due to these and other features, the webstore is likely to be a success! 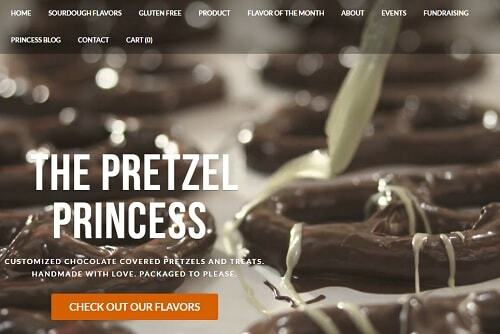 PretzelPrincess.com – the website of a small private manufacturing company, which offers customized handmade chocolate covered pretzels and treats. This website, powered by Weebly, which is manifested in the elaborate design and outstanding appeal. The first and the most exquisite element that astonishes a visitor is a bulky image with eye-catching chocolate pretzels, which look so delicious and tempting that trigger the desire to keep browsing through the resource to see what else one can purchase there. The website abounds in the photos of chocolate treats manufactured and sold by the company, while the catalogue of products includes the photos of each treat and the list of 24 flavors you may choose from with regard to your special needs and taste. This is very convenient and helps people see the samples of treats they can purchase. Have a Weebly website? Share it in the comments!